…dedicated to the IGNORANT Bible followers of the World, English and other Governments and Academic Theology of the Bible…! …anagrammatt of innocence…! Knowledge and innocence, the line and barrier between Animals and humans or “humanoids”…! Fruit ripe to eat…! Magic or mortality decay of mater and hence no real immortality…! 6 When the woman saw that the tree produced fruit that was good for food, was attractive to the eye, and was desirable for making one wise, she took some of its fruit and ate it. She also gave some of it to her husband who was with her, and he ate it. 7 Then the eyes of both of them opened, and they knew they were naked; so they sewed fig leaves together and made coverings for themselves. 8 Then the man and his wife heard the sound of the LORD God moving about in the orchard at the breezy time of the day, and they hid from the LORD God among the trees of the orchard. 15 But the gracious gift is not like the transgression. For if the many died through the transgression of the one man, how much more did the grace of God and the gift by the grace of the one man Jesus Christ multiply to the many! 17 For if, by the transgression of the one man, death reigned through the one, how much more will those who receive the abundance of grace and of the gift of righteousness reign in life through the one, Jesus Christ! …Jesus in the Gospels does not mention Adam as to be mentioned by him for sin or the origins of it…! THIS IS ONE OF THE BIGGEST MISSING DETAILS OF THE NEW TESTAMENT OF THE BIBLE…! …”This is tricky” Gen 2:9 ; in brackets was added on after…! They were not told hence of the second tree of life…! …So or either Adam & Eve could live forever in the Garden of Eden, IF they did not eat of the forbidden trees, or they would finally die as the fruit they were eating…! Or they were in a magic state in innocence and magic ripe fruit that were “perennial”…! …Why stop them to the tree of Life with Cherubims and expelling them from Eden ? And permit them to eat of the “WRONG Tree” that would mean their death and suffering and mortality ? SIMPLY BECAUSE THAT IS WHAT TO MOST, THAT is what we all really are: MORTAL and not much more than Animals as to an after life…! YOU STOP “access at the EAST” TO THE TREE OF LIFE, not because it is true, but because it is most likely NOT TRUE…! What about any other accesses ??? AS ALWAYS: ONLY one door ACCESS …!!! I have never understood the Bible in Genesis, simply because it is wrong…! You cannot ask INNOCENT beings = KIDS, to make all of us adults responsible for SIN, because of mere disobedience to a SADISTIC UNFORGIVING GOD of the Bible…! WHICH WAS A bit more than LIFE decisions that would take more than most adults to make a proper decisions today…! IT MUST BE THE SUBCONSCIOUS MIND MIS UNDERSTANDING OF WHAT IS READ AND TAUGHT OF THE BIBLE, that it has had some beneficial effect and purpose to “drug emotionally” ignorant populations, to help them believe and suffer in faith most anything…! BUT THEIR MINDS SOMEHOW “HURTS” knowing without knowing, it does NOT MAKE SENSE…! 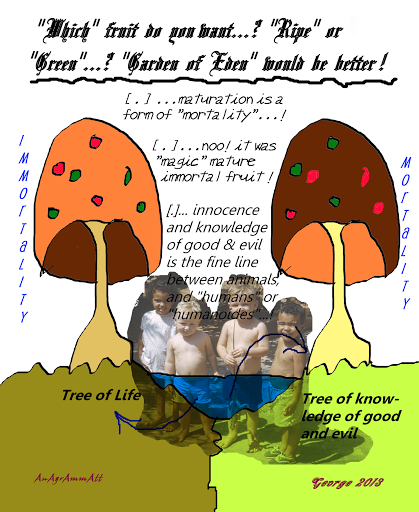 ← …another main true meaning of THE TREES of "Life" and "Knowledge of good and evil"…! …AnAgrAmmAtt of Inocence and Understanding – the barrier between "animals" and "humans"…!